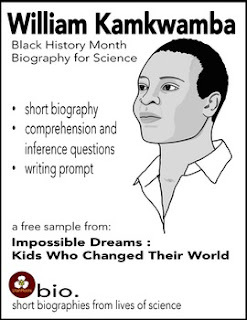 This Black History Month Biography for Science is William Kamkwamba, a Malawian made famous for building a windmill from junkyard refuse to bring electricity to his village when he was only 14 years old. His story was made famous by his appearance on TED Talks, a documentary film, and autobiography The Boy Who Harnessed The Wind. a set of six biographies of young people who made contributions to science and society at a remarkably young age. The biographies are written to teach and inspire today’s young people and to help them believe that young people can change the world. This is a limited time free product. It will be available through Feb 28th, at which time it will be discontinued. Click on the green star near my logo to follow my TpT store and receive notifications of new product releases.